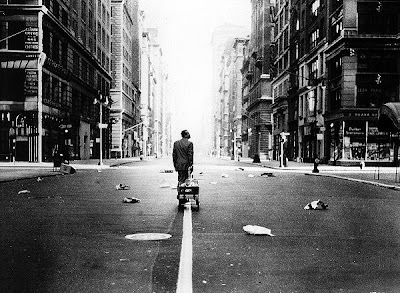 A black man, the last man on Earth, fends for himself in Manhattan after a global plague wipes out the rest of humanity. His loneliness overwhelms him. He slowly slips into insanity, speaking to mannequins he's set up throughout the city to approximate some form of normalcy. Every day at noon, he pleads into a short-wave radio, announcing his location, and his intention to broadcast indefinitely, hoping to get a response. Then he finds out he's not alone. That's the premise behind I Am Legend (2007), right? Wrong, but who could blame one for seeing the similarities? While Richard Matheson's novel, I Am Legend, has been adapted into a movie 3 times, none of those films has exactly captured the book's story. The most recent movie, starring Will Smith, probably comes closest. 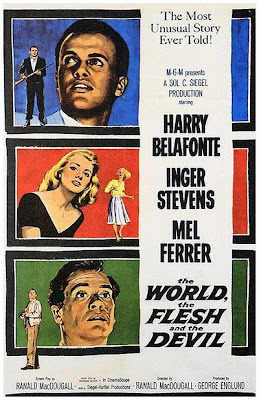 So imagine my surprise when watching Ranald MacDougall's The World, the Flesh and the Devil (1959) on TCM one afternoon, and finding that its premise, described in the first paragraph, is undoubtedly the real inspiration for the recent blockbuster. 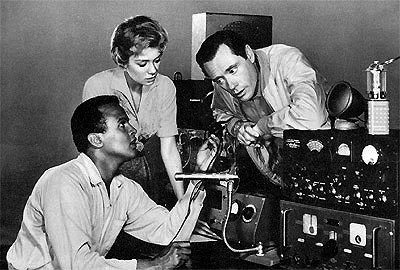 In World, Ralph Burton (Harry Belafonte), some sort of civil engineer, becomes trapped in a mine shaft. Finding a way out after 5 days of waiting for help, he discovers that something has eradicated the rest of humanity during his ordeal underground. Cars are abandoned on the street. Cities have been turned into ghost towns. He decides to search for any signs of life by driving to Manhattan, the area with the highest concentration of people he can think of. Arriving to the George Washington Bridge, he is greeted by a haunting sight - a bridge backed up with deserted automobiles - and must walk from there. Director MacDougall establishes a disquieting sense of isolation as Ralph walks through a city we are all very familiar with, even if we've never been there. Locations such as Times Square, always teeming with people, are presented here with nary a sign of activity. Like any engineer, Ralph starts the process of working through his situation by building a home, forging a small electrical grid for lighting, and gathering supplies. He collects works of art with the idea of preserving the remnants of humanity for posterity. He sets up a short-wave radio and announces his existence to anyone that may be listening. Slowly he slips into talking to himself, then holding conversations with mannequins he's surrounded himself with, finally lashing out at one in particular for always smiling. As he throws it over his balcony and it crashes to the ground, he hears a scream. Enter the lovely Sarah Crandall (Inger Stevens). Sarah has been following Ralph for some time, trying to deduce whether he is safe. Some of his behavior has made her nervous, but she soon realizes it is attributable to his solitude. And besides, wouldn't an engineer be the best person to have around during this kind of crisis. The two survivors grow close, and she becomes very fond of him. But Ralph's reticence to grow any closer is revealed when he is coerced into cutting her hair. He admits that, as a black man, he still can't get over the fact that if things were different, she would never even talk to him. Even though she implies she is in love with him, he can't get over that in this specific situation, he has gone from being a man of ingenuity to a subservient hair stylist grooming a white woman. After a time, she convinces them that with society gone, society's archaic rules should be done away with as well. She wants to move in with Ralph, even if it's simply in the same apartment building. But Ralph can't let go of his mindset right away. And just as it looks he might be starting to, another variable is thrown into the dynamic. Enter Benson Thacker (Mel Ferrer). Thacker was sailing around the world when the plague was loosed on the rest of humanity. He is starving and feverish, but Ralph and Sarah nurse him back to health, all the while conscious that the introduction of this white man means that society has been reestablished. Ralph believes that the unspoken rules concerning class and race have also returned. Sarah does not. Thacker for his part, admits that he's become attracted to Sarah, and does see Ralph as a threat. But it isn't because of his race, it is because of his youth. At this point The World, the Flesh and the Devil is derailed by a silly action setpiece that involves a confrontation between the two men in the deserted city. But the movie's first two acts are fascinating, not only because its premise has obviously been plagiarized by the recent Will Smith blockbuster, but because it avoids that film's zombie plotline to give us a rather realistic sociological examination of the intricacies of being the last people on Earth. 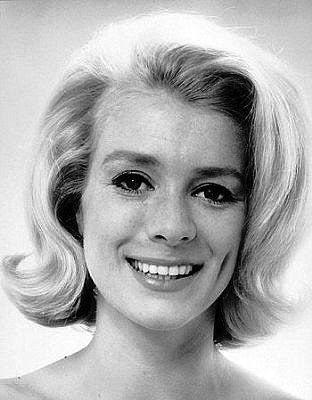 Utterly magnetic in one of her earliest appearances is the beautiful Inger Stevens (Hang'em High). She is better known for her TV guest work in the sixties, the most remembered of which are her two appearances on The Twilight Zone. In "The Hitch-Hiker," she plays a woman who keeps encountering the same hitchhiker, before she realizes she's dead and he is the Grim Reaper. In "The Lateness of the Hour," she also discovers she is not alive, when she finds out that in a home where her father has invented perfect robotic servants, she is the most perfect robot of all. Stevens would go on to great acclaim as the award-winning star of TV's The Farmer's Daughter. 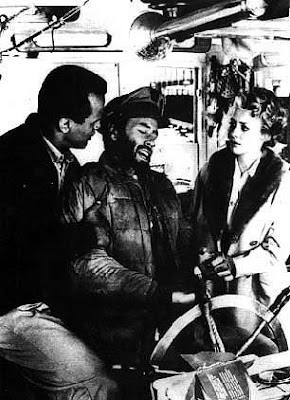 But her stormy private life, with the actress' propensity for affairs with her leading men (including this film's Belafonte), led to various suicide attempts before she successfully took her own life at the age of 35. 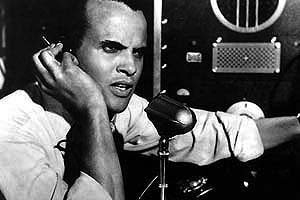 Belafonte (Island in the Sun) produced The World, the Flesh and the Devil, and has been an important civil rights activist throughout his long career in music and film, even refusing roles that promoted racial stereotypes. Ferrer (Lili), also an actor-producer, produced Wait Until Dark (1967) for his then-wife Audrey Hepburn. Coincidentally, he directed Stevens in some episodes of The Farmer's Daughter. He died last year at the age of 90. This post is a contribution to Jeremy Richey's month-long tribute to films that are M.I.A. on Region 1 DVD at Moon in the Gutter. Wow! On my way to go find it!! It looks fantastic! :( Days of hunting (Even for a R2 DVD) to no avail. Yeah, this is a tough one. I caught it on TCM. I wonder if it might be available on YouTube. Sometimes you find some rare ones there briefly before they take them down. a trailer or two and a scene. nothing overly substantial. It's a super-bummer. E-mailed Criterion (but we all know how that usually ends up) this just looks to fantastic not to see! Still trying to track this down, it's sort of become a mini-project of mine to figure out a way to see it. I just watched it two nights ago and was very impressed. It's beautifully shot and the performances (even from Ferrer, who has been known to be a bit, um, wooden) were top-notch. Great, haunting B&W cinematography. And boy, now having seen it, it is patently obvious the Will Smith movie must have referenced it (way more than I am Legend, which is one of my favorite, most-often reread books). Here's hoping they never remake this movie. They got it right first time around. 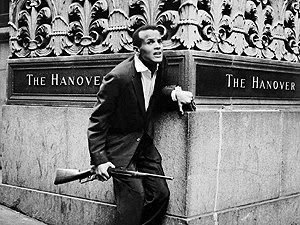 Oh, and just as a minor aside, the first adaptation of I am Legend, starring Vincent Price, is arguably the closest to the source material (the screenplay was even by Matheson, though he so disliked the end result he took his name off it and replaced it with the pseudonym Logan Swanson. Welcome to the site, Mr. Fingerman. Thanks for correcting me on which is the version closest to the original Matheson novella. Readers, Mr. Fingerman is an author and comic book artist whose work includes Beg the Question and Bottomfeeder.